A re-evaluation of JFK’s health history and medical records paints a portrait a man who had to endure a surprising amount of physical discomfort throughout his short life. As president, he did his best to hide his misery from the public—no small miracle, given just how much pain he was forced to endure. On January 20, 1961, John F. Kennedy, at the age of 46, became the youngest president in US history. His persona was one of youthful energy, health, and vitality, yet the reality was starkly different. New research published today in the Journal of Neurology: Spine shows that JFK suffered numerous illnesses and endured chronic pain from the time he was a child to the day of his assassination. It’s no secret that JFK suffered from chronic back pain—a condition he aggravated while rescuing a comrade during the war—but the new analysis is providing the most comprehensive look yet at JFK’s spinal problems and the many failed attempts to ease his tremendous discomfort. In the new paper, titled “John F. Kennedy’s back: chronic pain, failed surgeries, and the story of its effects on his life and death,” authors T. Glenn Pait and Justin T. Dowdy from the University of Arkansas analyse and discuss the many medical records Kennedy left behind, including case notes written by the various doctors and experts who treated him over the years. The authors primarily focus on Kennedy’s back problems, but they also discuss his other health issues. Kennedy’s real troubles began in 1937 when he was still an undergraduate at Harvard University. He injured his back while playing football, and it turned into something that would haunt him for his entire life. An orthopaedic spine specialist diagnosed JFK with a “very unstable lumbosacral joint” and recommended conservative treatment in the form of back manipulations. When World War II broke out, Kennedy’s back problems initially prevented him from entering into the army. Through his father’s political influence (Joseph P. Kennedy Sr. was a former ambassador to the UK), Jack obtained a commission in the US Naval Reserve in 1941. 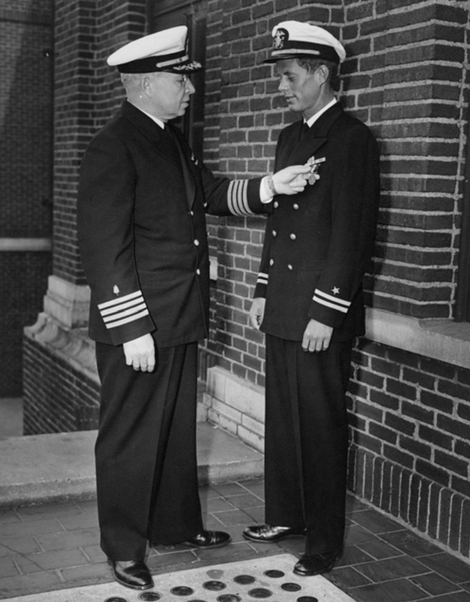 Despite his chronic back problems, Kennedy was deemed fit for duty, and he successfully completed PT boat training. He was ordered to Pacific Theatre on January 8, 1943. That same year, his PT-109 was rammed by a Japanese destroyer. In a well-documented episode, Kennedy managed to rescue an injured crewman by swimming for five hours with the strap of his life jacket clenched between his teeth, with his crewmate in tow. Kennedy would receive a medal for heroic conduct, and he would serve another six weeks before being released from active duty. But the impact of the collision, plus the exertion of the rescue, exacerbated Kennedy’s back problems. As Pait and Dowdy noted in their new review, this set Kennedy down a path that saw him undergo four spine surgeries from 1944 to 1957—all of which were unsuccessful. The first two surgeries (an L4–5 laminotomy and L5–S1 discectomy for you spine nerds) did little to improve his condition. The third surgery was done to alleviate the problems caused by the second operation, and the fourth cleared out an infection caused by the third surgery. with crutches...gritting his teeth when he walked...but then when he came into the room where the crowd was gathered, he was erect and smiling, looking as fit and healthy as the light-heavyweight champion of the world. Then after he finished his speech and answered questions from the floor and shook hands with everyone, we would help him into the car and he would lean back on the seat and close his eyes in pain. As president, Kennedy experienced some improvement owing to a new exercise routine, and more infamously, the pain-relieving benefits of methamphetamine injections and other analgesics. Indeed, JFK required strong medications to perform his tasks as president, including his dealings with Soviet Premier Nikita Khrushchev, resolving the Cuban Missile Crisis, and initiating the start of the Vietnam War. In 1963, JFK suffered a relapse, and he was forced to wear a tightly bound lumbar back brace. Many years ago, Dr. John Lattimer, a widely-published physician expert on the Kennedy assassination, suggested that the brace may have contributed to his death. The use of this brace, Lattimer theorised, returned the president to an upright position after Lee Harvey Oswald’s first shot, and subsequently back into his rifle’s scope site—allowing the assassin to make the second, fatal shot to the president’s head. In the new analysis, Pait and Dowdy claim it’s entirely plausible that Kennedy’s brace, which was tightly bound around his hips and lower back, “could have played a role in setting up Oswald’s final shot.” The researchers caution, however, that Kennedy wouldn’t have likely survived the first shot into his neck. ...JFK remains a case study in the complexity of human nature—an affluent political scion turned war hero, a serial philanderer and methamphetamine user, a civil-rights supporter and initiator of the Vietnam War who was both the youngest man elected president in the nation’s history and perhaps the 20th century’s least healthy one. His 1000 days in office encompassed a challenging period filled with civil unrest and the haunting spectre of nuclear war. Unbeknownst to the general public, Kennedy faced these external challenges while also battling the internal challenge of back pain that was all too often debilitating, and he relied on a near-daily therapy regimen, at times using various combinations of exercise, massage, procaine injections, support orthotics, crutches, narcotics, and illicit intravenous injections of methamphetamines in an attempt to manage this pain. By virtue of a relapse of pain in August of 1963 prompting more frequent use of an augmented brace, back pain may have ultimately played a role in President Kennedy’s death.